May is my last month for the club this year! I typically take the summer off from classes. 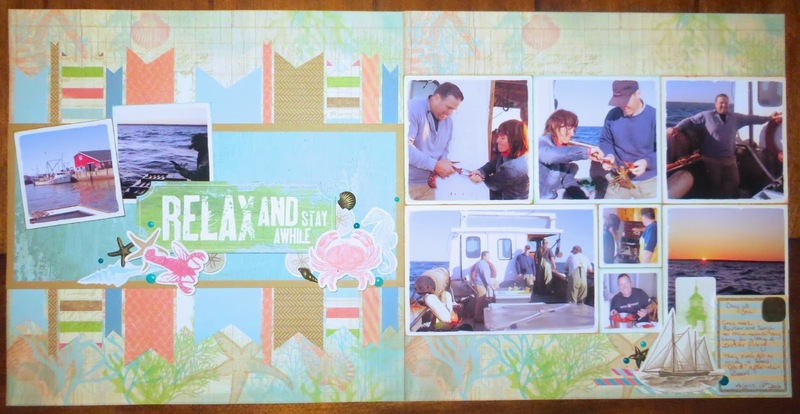 Wednesday May 6 and 13th - class offered for anyone who wants to sign up - we will make the double layout "Relax and Stay awhile" with the matching cards AND we'll make a second double layout. Cost is $30.00 for Supplies and a $20.00 order - you will have paper and embellishments left over (all extras are yours to keep). There will be a draw for a Stamp of the Month. 8 seats only (3 remaining) Please let me know by March 30th if you want a seat. Above the Second Layout for this month is a basic but beautiful lay-out. Left side has a 4 x 6 photo and one 3 x 5 and one 4 x 4.5. The Right side has two 4 x 6 photos and one 4 x 4.5 The flowers (I used yellow) can be colored any color that accent your photos - many possibilities! !